Home Stonehill Alumni Magazine: Winter | Spring 2018 Features Who But Leo Meehan? Meehan plays the guitar daily. Meehan, right, with one of his best friends, Kevin O'Connor '75. The duo often performed together at Brother Mike's. 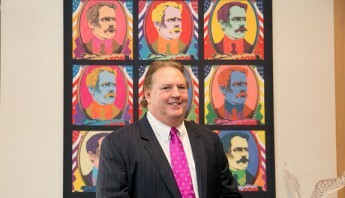 Meehan's office is similar to a family den, adorned with a mural of the W.B. Mason logo. Meehan's office is similar to a family den, adorned with family memorabilia and items from his youth like his boyhood paper route bag. A Lego replica of the W.B. Mason building in Brockton created by Meehan's nephew, William Marsen. 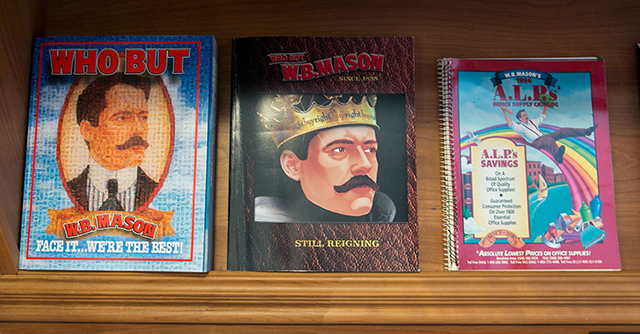 Meehan's office is similar to a family den, adorned with Mason products. Leo J. Meehan III ’75 got into sales because of a car. A Thunderbird, to be exact. Specifically the one owned by Joseph Flanagan ’65, the salesman he lived next door to as a kid. 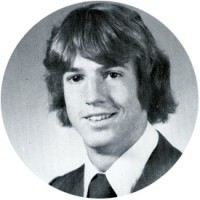 Back then, Meehan set his sights on a job in sales that would allow him to buy his own dream car. And that’s just what he did. Only Meehan didn’t expect what happened next. Almost no one did. But let’s start at the beginning. With his earnings, Meehan bought baseball cards and saved the rest. After graduating from Boston College High School, he enrolled at Stonehill—again, following the path of his neighbor Flanagan—as an economics major. But it was music that captured Meehan’s imagination. 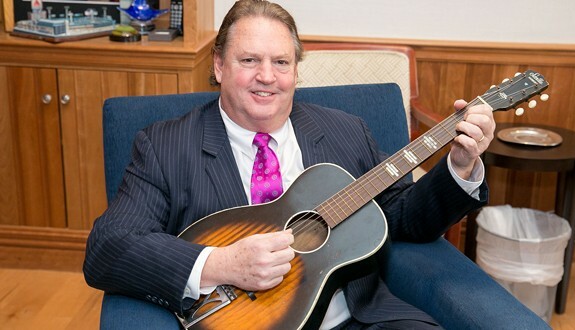 “Playing guitar and singing with my friends were the best times I ever had at school,” he says. 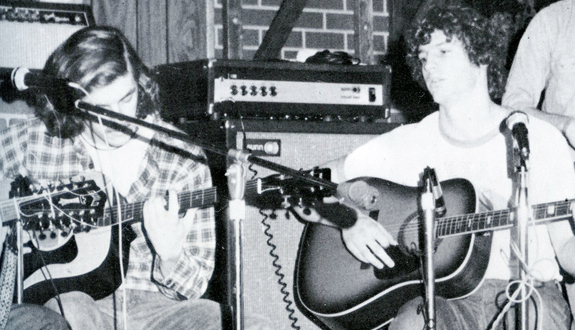 Gaffney jokes about those days: “He got us all into guitar, whether we liked it or not. He got out the guitars, tuned them, handed them to us and told us what to play.” To this day, every night after work, Meehan can be found at home playing and writing songs. “My favorite place is alone with my guitar,” he says. William Betts Mason founded a rubber stamp and stencil company in 1898. From humble beginnings in a small warehouse in Brockton, W.B. 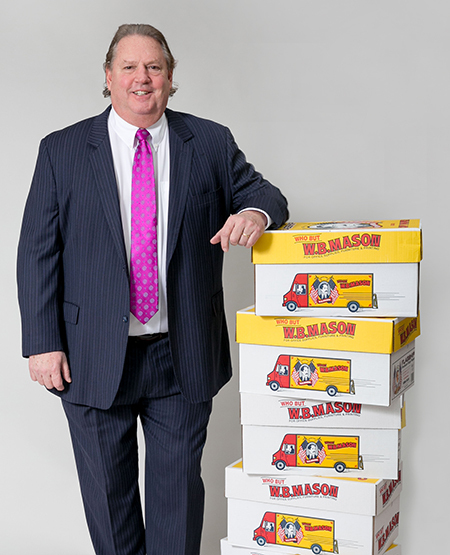 Mason has grown into the second largest privately owned office products dealer in the United States, with over 70 locations across the country. When Meehan started as a salesman in 1975, the company had two delivery trucks, employed 14 people and had annual sales of $900,000 a year. Now, it has more than 1,000 trucks, employs more than 4,000 and has projected sales just shy of $2 billion. Today, W.B. 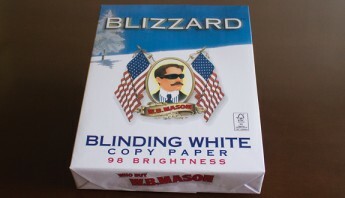 Mason is the fourth largest office products dealer in the world. Meehan’s rise at W.B. Mason was meteoric. The company named him as vice president of marketing in 1979. He was 26. In 1983, he was made a partner and by 1987, he was responsible for day-to-day operations and strategic planning. In 1994, he became president and CEO. One of Meehan’s most notable successes was the rebranding of the company. 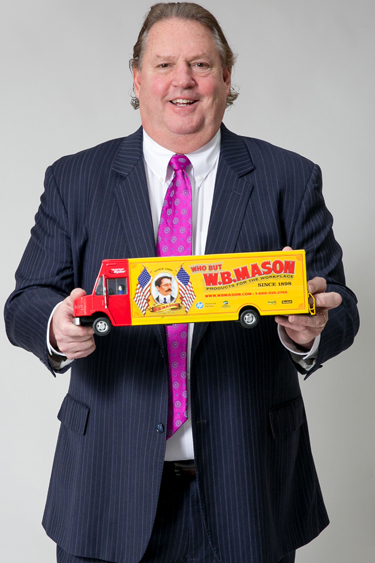 Partnering with advertising savant Paul Steven Stone, the pair introduced the iconic slogan, “Who But W. B. Mason.” The slogan, later combined with circus-like, old-fashioned lettering and a portrait of the company’s founder, became instantly recognizable. Thanks to Meehan, W.B. 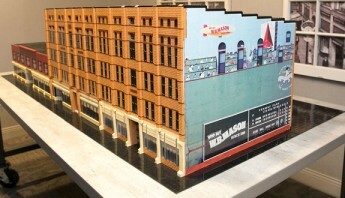 Mason was the first company to place an ad on the legendary Green Monster, ending the Boston Red Sox’s 50-year moratorium on advertising on its leftfield wall. Meehan also placed ads in several other ballparks. The company was the major donor for Stonehill’s W.B. Mason Stadium, which opened in 2005. In an industry with slim margins and stiff competition from the likes of office supply retail giants Office Max, Office Depot and Staples, Meehan has managed to steadily increase W.B. Mason’s market share and profits. Whenever the economy slumped and competitors started to close stores and lay off staff, Meehan made his move. Because W.B. 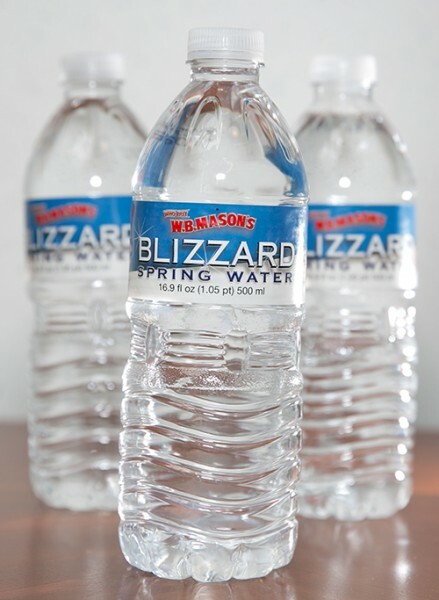 Mason didn’t have the retail locations and overhead of its rivals, he was able to keep salespeople, amp up customer service and add delivery trucks. Meehan’s strength is his ability to see the big picture and act on it. He doesn’t try to copy what others are doing, and he isn’t afraid to try innovative things. In 1997, when Meehan introduced same day delivery, his staff thought he was crazy. “Why are you doing this to us? No one is asking for it,” they said. Turns out Meehan was ahead of the curve, instituting something Amazon has been trying to accomplish for years. Thanks to Meehan’s foresight, W.B. 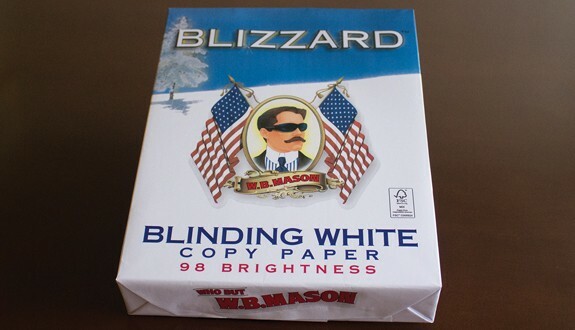 Mason isn’t just an office supply business any more. Ten years ago, it expanded into janitorial and facilities products, break room goods, coffee, water, food service items and shipping supplies. Just this spring, the company rolled out its first four electric delivery trucks. Meehan’s office is unusual. It’s more like a family den than a work space, with upholstered couches and chairs, an Oriental rug, a gas fireplace and built-in bookshelves full of mementos and memorabilia. There are family photos, framed art from his favorite W.B. Mason ads and a sketch of a young Meehan, with flowing Don Henley hair, playing his guitar. 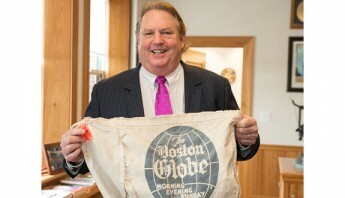 On a doorknob in the corner hangs a worn Boston Globe shoulder bag with a once-bright orange strap. One thing missing from Meehan’s office is a computer. He doesn’t own one. And he doesn’t use email. He doesn’t mind texting, but what Meehan would rather do is talk—on the phone, or better yet, in person. Meehan, W.B. Mason and Stonehill have developed a deep and lasting relationship. Meehan joined Stonehill’s Board of Trustees in 2002 and was a member of the College’s President’s Council for many years. As a Board member, he was surprised to walk into a meeting one day to find his former counselor Fr. Olszewski, who was also a trustee.